Aasiya Andrabi, who is chief of the banned outfit Dukhtaran-e-Milat, was produced before the court along with her two women associates, after the expiry of their 10-day NIA custody. 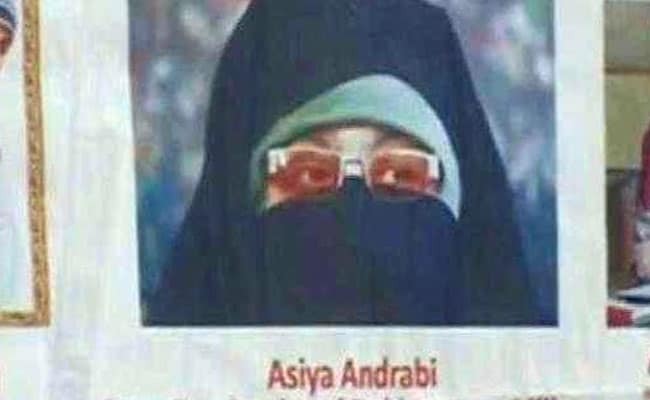 Aasiya Andrabi was in a prison in Srinagar after the court cancelled her bail last month. Kashmiri separatist Aasiya Andrabi was today sent to one-month judicial custody by a Delhi court in connection with a case of allegedly waging war against the country with support from Pakistan. District Judge Poonam A Bamba sent the trio to judicial custody after the NIA said they were not required for further custodial interrogation. The NIA had claimed that a probe revealed that they were running a concerted campaign to elicit support from the neighbouring country and accused them of being involved in conspiracy and acts to "severely destabilize the sovereignty and integrity of India". The three accused will be kept in Tihar Central Jail. Besides Aasiya Andrabi, her associates Sofi Fehmeeda and Nahida Nasreen were also sent to judicial custody. The case was registered against the three women in April this year. Aasiya Andrabi was in a prison in Srinagar after the Jammu and Kashmir High Court cancelled her bail last month. The NIA, on directions of the Union Home Ministry, registered a case against them as well as the organisation, which is banned under the Unlawful Activities (Prevention) Act, 1967, in April this year. According to the FIR, the "central government has received information that Aasiya Andrabi and her associates namely Sofi Fehmeeda and Nahida Nasreen are actively running a terrorist organization named as 'Dukhtaran-E-Millat' (DEM) which is proscribed under the First Schedule to the UAPA". The agency also said in the FIR that Aasiya Andrabi and her associates had allegedly spoken, written and also published "visible representations that bring into hatred and contempt apart from exciting disaffection towards the Government of India". Lok Sabha Elections 2019: After Varanasi Show, PM Thanks Media, Says "You've Been Working Hard"